Dominating Paktia Panthers will be locking horns with confident Kabul Zwanan for the second semifinal of the APL 2018 in what has been an absolute treat for the cricket fans with some scintillating matches on offer. It will be the third meeting between the Paktia Panthers and Kabul Zwanan in the ongoing APL 2018. Interestingly, these two met in the first as well as the last league match of APL 2018. Thus, with two even teams set to clash for a knockout game, the Paktia-Kabul encounter is expected to be a hard-fought affair with plenty of exhilarating performances on the cards. Paktia Panthers have had a decent tenure under the captaincy of Mohammad Shehzad. With five wins and three defeats, they finished the league stage on the second position just below Balkh Legends. Unquestionably, batting has been the backbone for Paktia Panthers ever since the start of the tournament. With the equals of Mohammad Shahzad, Cameron Delport, Sikandar Raza, and Callum MacLeod, Panthers have possessed one of the most powering batting lineups. Besides that, Panthers have excelled in the bowling department as well. They have had some decent blend of overseas and national bowlers which has made the job easier for Mohammad Shahzad. Isuru Udana has been their top-notch bowler with as many as 15 wickets to his name. Thus, with a nicely poised team on their front, Paktia Panthers will look to derail Kabul Zwanan while fixing themselves a birth for the finals. 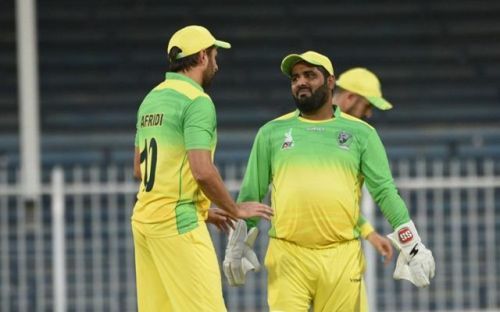 Probable Playing XI for Paktia Panthers: Mohammad Shahzad (C & WK), Ihsanullah Janat, Cameron Delport, Calum MacLeod, Samiullah Shenwari, Fazal Rahman Zazai, Shahid Afridi, Tahir Khan, Sharafuddin Ashraf, Isuru Udana, and Ziaw Rahman. Meanwhile, Kabul Zwanan has been equally good under the leadership of Rashid Khan. Despite some bit of inconsistency, they managed to keep them in the contention for the knockout stages. Kabul Zwanan, with four wins and four losses, concluded the league stage as the third-ranked team. Much like Paktia, Kabul has a decent crop of batsmen. Hazratullah Zazai, Luke Ronchi, Colin Ingram, and Laurie Evans have done wonders for Kabul in the batting department. Besides, quickies from Wayne Parnell and Rashid Khan have helped them too. However, erratic bowling has been an enigma for them ever since the start of this league. Despite the likes of Parnell and Rashid Khan, Kabul Zwanan has been quite irregular on their bowling front. Thus, with exceptional batting on their side, Kabul Zwanan will look to perform decently with the ball while eyeing a spot for the finals. Probable Playing XI for Kabul Zwanan: Luke Ronchi (WK), Hazratullah Zazai, Colin Ingram, Afsar Zazai, Laurie Evans, Shawkat Zaman, Shahidullah Kamal, Rashid Khan (C), Wayne Parnell, Fareed Ahmad, and Zahir Shehzad. With immaculate batting strength and more than good bowlers, Paktia Panthers looks strong on paper. Besides, Mohammad Shehzad's form with the bat and Isuru Udana's magic with the ball would strengthen them in the course of the game. Thus, considering all the facts, Paktia Panthers are expected to continue their winning run while becoming the only team to play the first as well as the final match of the APL 2018. Expected top performers for Paktia Panthers: Mohammad Shahzad, Calum MacLeod, and Isuru Udana. Expected top performers for Kabul Zwanan: Colin Ingram, Wayne Parnell, and Hazratullah Zazai. Final Prediction: Taking into the consideration the overall form and team balance, Paktia Panthers are expected to end Kabul Zwanan's tourney while booking themselves a ticket for the finals.